If you’re a foodie or love Instagram wellness accounts, you’ve probably seen images of bright, beautifully coloured lattes, ranging from green, blue and yellow to pink and even black. These are the “rainbow lattes”. While food dyes were first used to create shades, the health scene has turned them into superfood drinks using natural powders instead. Unlike ordinary lattes, where contrasting colours of milk and coffee are used, rainbow lattes usually don’t contain caffeine and use turmeric, beetroot, green algae, matcha tea and even charcoal to add colour and the nutritional benefits that come along with them. 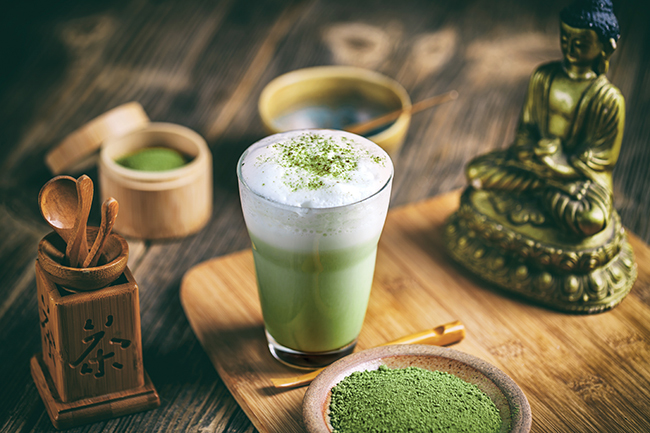 One you’re probably very familiar with, is matcha latte, which is simply matcha green tea powder blended with frothy almond or coconut milk and maybe a generous sprinkle of cinnamon. A better alternative to your morning cup of coffee, it will give you a boost of energy that will be slowly released throughout the morning without causing the sudden rise and then crash of normal caffeine. And it contains l-theanine, an amino acid that stimulates calmness without drowsiness and can balance out the caffeine content. Plus it aids the increase of concentration – perfect before an exam! 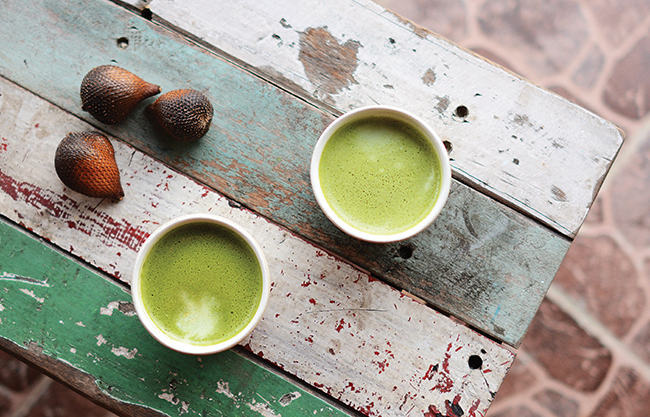 Green tea is known to be rich in antioxidants which are even more concentrated in matcha. One especially, called epigallocatechin gallate (EGCG), supports skin health by reducing inflammation and free radicals that accelerate skin ageing. So you can enjoy your latte and glow inside out! If you’ve seen pictures of green lattes that look a bit darker, almost a deep blue green colour, they’re probably made with spirulina and chlorella that have been mixed with nut milk and often the addition of spices and a touch of natural sweetener. It’s the perfect way to have a dose of greens if you’re not a fan of vegetables or don’t like the taste of green superfoods by themselves. Spirulina and chlorella are a powerhouse of essential nutrients like vitamins, trace minerals, iron, essential fatty acids and plant based protein thanks to a high chlorophyll content. Spirulina is rich in easily digestible amino acids and powerful antioxidants that protect cells from damage, such as phycocyanin and beta-carotene. It also stimulates the immune system. Chlorella is another concentrated chlorophyll source that is great at pulling toxins from our tissues and helps eliminate them, as well as facilitating the removal of heavy metals. An additional beautiful rainbow latte made from algae, is blue latte. It will definitely be loved by kids too, as it looks like it came straight from the world of Smurfs! It’s created using the E3 blue majik algae powder to give your latte the prettiest shade of blue. Perfect paired with coconut milk, vanilla and ginger. It’s like drinking a magic potion! Just like spirulina and chlorella, blue majik is very nutrient dense, filled with vitamins like B12, minerals, enzymes and compounds that have strong antioxidants and anti-inflammatory properties that can benefit our cells integrity and the health of our tissues and brain. One of them is c-phycocyanin, a type of storage protein rich in amino acids that gives this algae its bright blue colour. Nature is magic! Another latte that seems like it came straight out of a fairytale, is beetroot latte with its vivid pink colour. Delicious mixed with ginger or with the addition of rose oil and a sprinkle of edible flower petals on top. Beetroots are another good source of antioxidants like vitamin C, manganese, and betalains that give these vegetables their deep red colour. All these compounds can support the lowering of systemic inflammation in the body caused by internal or external stressors in our everyday lives and reduce oxidation. Plus, betalains can support liver detoxification phase two where toxins are made water-soluble so they can be then excreted from the body. Sometimes, pink lattes will be made from pitaya or dragon fruit, which is a delicious fruit of a cactus plant grown in Central and South America and South East Asia. The frozen pulp can be used in smoothie bowls, while the dried pulp powder can be whisked into warm nut milk to create a bright pink drink. You may also have tried golden milks or turmeric lattes, where turmeric powder is mixed with black pepper, spices, maybe coconut oil, and added to frothy plant based milks. I personally love adding cinnamon, ginger, cardamom and vanilla and pair the turmeric paste with coconut milk – heavenly! 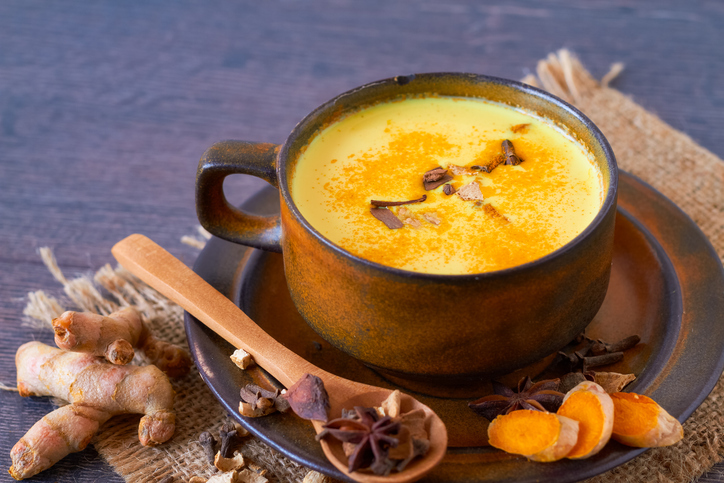 Golden milk comes from the ayurvedic tradition, where turmeric has long been used to support a healthy inflammatory response. This spice contains special compounds that can actually block inflammatory responses in the body and act as anti-inflammatory drugs. Now, you may not be able to get all these powerful effects from a teaspoon of the powder, but you can still sip on a warm mug a day to enjoy some of its benefits. In India, this comforting drink is used at bedtime for its soothing effect on the digestive and nervous system. If you’re not a lover of bright colours, there is still a rainbow latte just for you – charcoal latte. Made with the addition of activated charcoal powder, it gives a drink a grey and black hue. You can pair it with any dairy-free milk of choice, but make sure to use only a tiny amount of the powder so that the latte can still have a pleasant taste. Also, mix in a pinch of vanilla and a touch of sweetener. Activated charcoal tends to be used in gastrointestinal issues like bloating, indigestion and irritable bowel, as it can reduce tension and discomfort while binding to toxins, helping to eliminate them. The tiny amount in the lattes will unlikely have any major effects on your health though – but it will still be nice to sip on a black magic potion! Whether you order your latte at a cafe or make your own, for best results and a true ‘latte-like’ texture, choose a milk that froths well. Coconut, almond and cashew are all good options. 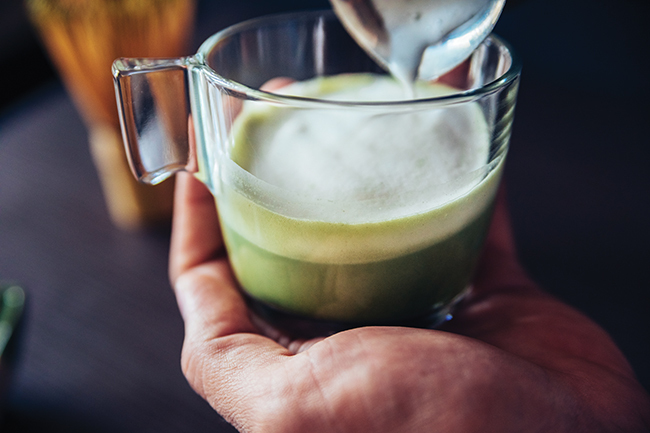 If you want to try green lattes, start by adding ½ tsp of green powder and see how you like the taste, adjusting with more milk, sweetener or spices. Spices are great in rainbow lattes and complement the different powders, so experiment with unique combinations. If you want your rainbow mug extra fluffy, use a handheld milk frother or, if you have a blender, blend the drink for a little while – it incorporates air and becomes nice and frothy. Make your own rainbow magic! Either use 230ml (8fl oz) plant based milk or make homemade nut/coconut milk by blending 450ml (16fl oz) water with 150g (5oz) nuts/coconut chips, a pinch of salt, 1 tsp vanilla and an optional 1 Medjool date or 1 tbsp sweetener of choice. Then use 230ml (8fl oz) for the latte recipe. Add the spirulina/beetroot powder, spices and vanilla to a medium-large mug. Pour a tbsp hot water over the powder and whisk until forming a thick paste. Add sweetener and the rest of the hot water, whisking until the powder is completely dissolved. Pour the milk into a medium saucepan and warm over medium high heat until warm, but not boiling. Froth the milk and then pour into the mug. Pour the warmed up milk into a blender together with the rest of the ingredients, blending until smooth and frothy. You can even make more and store in an airtight container in the fridge. Simply warm up again or shake and enjoy chilled or iced!